Our success is the result of our focus on helicopter safety, business integrity and a passion for the aviation industry. 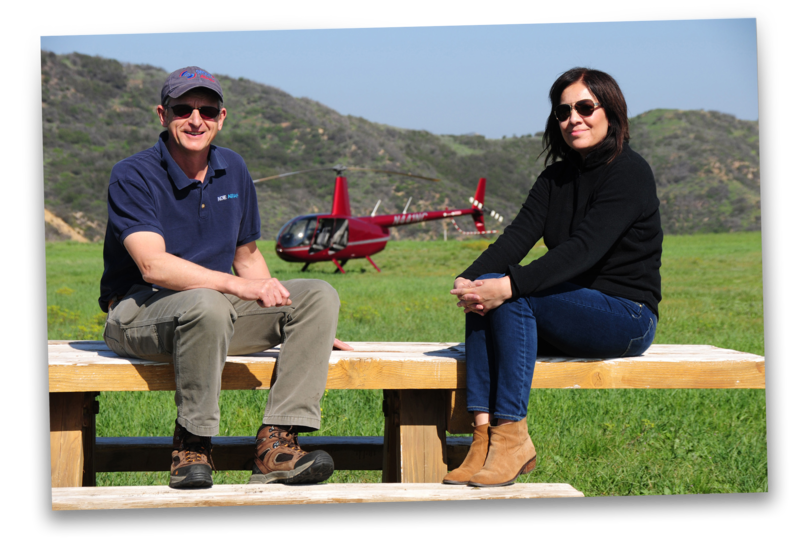 Group 3 Aviation has served the Greater Los Angeles area for over 25 years, providing commercial helicopter services, aerial photography, helicopter tours, and helicopter flight training for tomorrow's pilots. We are highly certified by the US Government and the FAA for multiple operations and services. To maintain the highest standards of ethical behavior and professional integrity. To employ people of exceptional determination who work closely with one another and with our students. To pursue professional growth and market diversification to increase value for the school, students and opportunity for our staff. To not only respond to current requirements, but to also anticipate emerging needs. To foster a positive teaching and learning environment that encourages safety and communication. FAA 135 Air Carrier Certification with authorization to carry passengers and cargo on demand. FAA 133 Operating Certificate for external load operations. FAA 136 Letter of Authorization to carry passengers on air tours. FAA 141 Air Agency certification with school authorization to train pilots through approved courses. FAA Approved - Certificate of Authorization - Motion Picture and Television Flight Operations Manual. Veterans Administration authorization to train veterans through professional pilot qualifications. SEVIS authorization to issue M-1 student visas for international students. The AS350 B2 has a 3 blade rotor system which provides a vibration free smooth ride, reliable powered by a single Turbomeca Arriel 1D1 engine. The passenger cabin is open, comfortable and quiet, visibility is good through large side and front windows, all seats face forward. Baggage is stowed in 3 separate baggage compartments. Traffic avoidance alert system, Garmin integrated avionics system, Air Conditioning. Uses: Passenger transport for tours and charter, aerial work. Approved for Day Time and Night Time Visual Flight Rules conditions. Maximum Takeoff Weight: 4961 lbs. Baggage compartments 3x Rear: 146 lbs, Right 220 lbs, Left 264 lbs. Baggage volume: 35.3 cu. ft. The Robinson R44 II has a 2 blade rotor system which provides a smooth ride, reliable powered by a single Lycoming fuel injected engine. The passenger cabin is open, comfortable and quiet, visibility is good through large side and front windows, all seats face forward. Baggage is stowed in 4 under seat baggage compartments. Garmin integrated avionics system, Air Conditioning. Cabin volume: **** cu. ft.
Baggage volume: **** cu. ft. The following outlines our helicopter tour policies. If you have questions not answered here, please don't hesitate to give us a call at 818-994-9376. The safety and comfort of our passengers is very important to us. Therefore it is necessary that each passenger be asked for their height and weight. The distribution of weight is vital to safety in a helicopter and it is our responsibility to make sure that the aircraft is not overloaded or out of balance. There are also per seat weight limits for each aircraft. Total weight of all Passengers, not to exceed 600 lbs. Passengers weighing over 250 lbs. will require and additional fee. The helicopter has a payload of 900 lbs and we factor in pilot weight, fuel weight and passenger or cargo weight when making a decision. The Pilot-in-Command will make the final decision for acceptable passenger weights. Total fares include applicable taxes and fees. Any child under 24 months of age is welcome as a lap child at no charge. Children 24 months and over require an individual full-fare seat. Please ask about our special pricing offers. Single passengers are subject to additional charges. All transactions are conducted in U.S. Dollars. Rates are always subject to change. All flight activities must be prepaid at the time of booking with a credit card. Checks are not accepted. If you wish to pay cash, we can reverse charges on the credit card once you arrive. Full payment is required at the time of reservation. According to the Federal Aviation Administration (FAA), it is our responsibility as air operators to establish each of our passenger’s identity. You will be asked to present a government issued photo ID prior to boarding the aircraft, please be sure to bring this with you. One form of identification with a photo for each adult passenger is sufficient. Our tours are suitable for the entire family. Minors must be accompanied by a responsible adult, usually parent or legal guardian. Contact Group 3 Aviation in advance for important legal requirements for minors accompanied by an adult other than their parent or legal guardian. Children under the age of 2 ride free when there are a minimum of two adults. Refunds are determined by the date/time that you notify Group 3 Aviation of your cancellation. Company pilots have no authority to grant or promise refunds. A non-refundable 4% service fee for each booking applies if you cancel for any reason. A flight reservation can be re-scheduled for a different day and time. Cancellation policy applies if a re-scheduled tour is cancelled for any reason. If we have to cancel a flight due to adverse weather conditions, you will receive a full refund if you cannot reschedule, without a service fee penalty. Bad Weather is determined by the pilot on the day of the flight. All flights are subject to weather and ATC (air traffic control) limitations per Federal Aviation Regulations. The go/no-go decision of the pilot-in-command is always final. Flight routes may be subject to change due to unforeseen circumstances in respect to weather, airspace closures or temporary flight restrictions, which are out of our control. Group 3 Aviation regrets that it cannot make exceptions to the reservation and cancellation policy for any reason, including personal emergencies. The reservation and cancellation policy applies to all reservations. We require 24 hours’ notice in order to change or cancel your reservation. Tours canceled with less than 24 hours affect other guests booked on the flight and does not allow enough time to resell the cancelled seats. Reservations canceled within less than 24 hours of the departure/tour time will be assessed a 50% cancellation fee. No-shows will be assessed a 100% cancellation fee. If you need to change or cancel your reservation, please provide us with at least 24 hours’ notice prior to your departure/tour time and we will be happy to accommodate you. There is a non-refundable service fee for each booking and only applies if you cancel for any reason. If you are due a refund it will be less the 4% service fee for the booking amount. Group 3 Aviation’s cancellation policies shall be enforced for any Cancellations and No Shows. All charges are responsible by client. All Group 3 Aviation flight activity participants must sign the Liability Release and Assumption of Risk document. You will be asked to sign and return this form to any Group 3 Aviation staff member as appropriate prior to boarding Group 3 aircraft. You should understand that flying activities (or any trip of this nature) contain inherent risks, including injury and potential death. Those who participate in this flying activity assume all of the risks and will hold Group 3 Aviation, Inc., its agents, and members harmless from any and all responsibility, negligence, actions, or suits of any kind or nature whatsoever, for loss or damage to property or personal injuries sustained during this activity. Our main goal is providing you with a safe, enjoyable, and inspiring flying experience.